Such was the general situation at 2 a.m. on October 31st, at which hour I received a visit from Foch, who promised to let me have effective support for Haig on this day, namely, five battalions of French infantry and three batteries of artillery. Shortly after dawn on this fateful 31st October, we had news that a serious infantry attack was developing on the left of the 4th Division in the valley of the River Douve. The 4th Division was able to extend its line some little way to the north of the river and thus release troops of the 1st Cavalry Division, which subsequently fought fiercely all day at Messines. Throughout the day the left of the 4th Division rendered valuable and efficient support, as did the artillery on Hill 63, about one mile north of Ploegsteert. But the great events of the day took place between Gheluvelt on the north and Messines on the south. Early in the morning Allenby reported that Messines was being heavily attacked, and that the 9th Lancers had been withdrawn after suffering severely; that the eastern exit of the town was held by the 4th and 5th Dragoon Guards, and that the situation was "decidedly critical." A heavy attack had been delivered against the right of the 1st Cavalry Division shortly after 7 a.m., and an Indian Battalion of Rifles (the 57th, attached to the 1st Cavalry Division) were driven from their trenches. The reserves, however, held on, and the Inniskilling Fusiliers retook the trenches which the 57th had lost. At 9.30 a.m. large masses of infantry were reported to be advancing against the 2nd Cavalry Division between Oesttaverne and Roozebeek, and long columns of the enemy were seen on the road leading from the former place to St. Eloi. Shortly afterwards I reached Allenby's Headquarters, which were now at Groote Vierstraat (between Mont Kemmel and Ypres). After we had discussed matters, Gough arrived. Explaining the situation to me, he said he was in occupation of the canal to the north-east of Hollebeke, whence he had been driven back the day before. Thence his line extended south till it joined the left of the 1st Cavalry Division. He was in complete possession of Wytschaete, but he asked Allenby for some further support on the canal. Kavanagh's Brigade (1st Life Guards, 2nd Life Guards and Royal Horse Guards), which had been returned by Haig, was sent to him. Just then I got a report that the five battalions of French infantry, which had been promised by Foch, were now directed to make a counter-attack from Verbranden Molen towards the canal at the dangerous point. The 2nd and 3rd Cavalry Divisions were heavily attacked during the day, but by dark they held the same ground as on the night before. The most critical fighting of the day in this part of the line was at Messines, on Allenby's right. By 9 a.m. the cavalry were driven out of Messines, holding only one or two houses on the eastern side. Owing to heavy pressure elsewhere, no support was available until Shaw's (9th) Infantry Brigade could arrive. It reached Kemmel at 10 a.m.
Gough sent the London Scottish to join the 3rd Hussars in support of Bingham's 4th Cavalry Brigade (Household Cavalry, composite regiment, 6th Dragoon Guards and 3rd Hussars) on the left of the 3rd Division. At the same time, three battalions of French infantry, supported by 12 guns, were just starting their attack from St. Eloi on Oesttaverne. At about 11.45 a.m., two battalions King's Own Scottish Borderers and King's Own Yorkshire Light Infantry were sent forward to retake the Messines ridge. 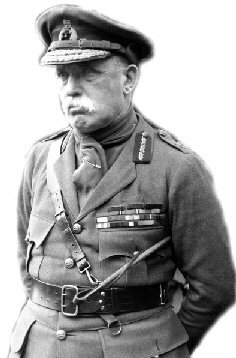 General de Lisle, commanding the 1st Cavalry Division, was commanding at Messines. The Oxfordshire Yeomanry and an Indian battalion were the last reserves sent up to him. About noon, when the 1st Cavalry Brigade were still clinging to the western edge of Messines, a counter-attack by the 3rd Hussars and London Scottish began on the north of the village. By 1 p.m., considerable progress had been made. The 3rd Corps had regained the trenches north of the River Douve to within half a mile of Messines. The K.O.S.B. were on the right of the town, and the K.O.Y.L.I. on the left. The London Scottish and 3rd Hussars were engaged on the north of the latter, and an intense struggle for the convent and southern portion of the town, which was a point from which the lost ground could be recovered, was proceeding to our advantage. At this hour the news appeared more hopeful, and I left Allenby in order to join Haig at Hooge, east of Ypres. A battalion of French arrived to support the troops fighting at Messines just as I was leaving. I learned later that the London Scottish attack reached the north edge of Messines shortly after 2 p.m.; that towards 4 p.m. the attack was checked on the Messines—Wytschaete road by heavy artillery; that fierce fighting went on in the streets, and that the town was severely shelled; but that, later, the Germans were driven completely out, and were holding the ridge to the east, including a ruined factory and some farms to the south. At nightfall the line held about Messines was the same as in the morning. As I passed through Ypres on my way to Haig, there were manifest signs of unusual excitement, and some shells were already falling in the place. It is wonderful with what rapidity the contagion of panic spreads through a civilian population. I saw loaded vehicles leaving the town, and people were gathered in groups about the streets chattering like monkeys or rushing hither and thither with frightened faces. As we passed by the ancient Cloth Hall, the old Cathedral, and the other splendid examples of Flemish architecture for which this town was famed, I did not realise how soon the atmosphere of German "frightfulness" was to reduce all these noble buildings to a heap of ruins. Although to-day Ypres as a city has ceased to exist, I am thankful to know that no German soldier has ever set foot within its walls save as a prisoner. Here, as at Verdun, they did not pass; and the glory is that of every soldier in the ranks. On reaching the eastern exit of the town, on my way to Hooge, I was stopped by a guard specially posted by First Corps Headquarters, with orders to prevent anyone leaving the city. Satisfying them as to my identity, I proceeded on my way. I had not gone more than a mile when the traffic on the road began to assume a most anxious and threatening appearance. It looked as if the whole of the 1st Corps was about to fall back in confusion on Ypres. Heavy howitzers were moving west at a trot—always a most significant feature of a retreat—and ammunition and other wagons blocked the road almost as far as the eye could see. In the midst of the press of traffic, and along both sides of the road, crowds of wounded came limping along as fast as they could go, all heading for Ypres. Shells were screaming overhead and bursting with reverberating explosions in the adjacent fields. This spectacle filled me with misgiving and alarm. It was impossible for my motor-car to proceed at any pace, so we alighted and covered the rest of the way to Haig's Headquarters on foot, nor did I receive any encouragement on the way to hope for better things. The château of Hooge, where 1st Army Headquarters were situated, has long since been erased from the face of the earth in the severe fighting which had raged about it. But as I found it on that October afternoon, it was a typical modern red brick château, approached by a gate and a short avenue from the road. Shells were falling about the place, and the château was already beginning to show the effects of artillery fire. I found Haig and John Gough, his Chief of Staff, in one of the rooms on the ground floor, poring over maps and evidently much disconcerted. But, though much perturbed in mind and very tired in body and brain, Haig was cool and alert as ever. Both he and Gough gave me a bad account of the state of affairs. This is what happened on the front of the 1st Corps. In the morning the position along the line was normal. About 10 o'clock rather a disturbing situation developed south and south-east of Gheluvelt. A local counter-attack failed, and some trenches east of the village had to be abandoned. There was heavy shelling along the front of the 7th Division and of the 2nd Brigade (2nd Battalion R. Sussex Regt., 1st Battalion N. Lancs Regt., 1st Battalion Northampton Regt., and 2nd Battalion K.R.R. ), but no infantry attack. At 10.30 a.m. the 1st Division line, north of the Ypres—Menin road, was forced to retire in face of a heavy infantry attack covered by artillery. Lomax, commanding the Division, ordered the 1st (Guards) Brigade (1st Battalion Coldstream Guards, 1st Batt. Scots Guards, 1st Batt. Black Watch and 1st Battalion Cameron Highlanders) north of the road to be ready to enfilade the enemy's advance. By 11.30 a.m., thanks to strong support from our artillery, the situation about Gheluvelt became easier; but at 12.15 p.m. the enemy were again reported to be massing east of the village, and the situation once more became threatening. The G.O.C. 1st Division made arrangements for calling on the 2nd Battalion Worcesters (5th Brigade, 2nd Division) for a counter-attack due south, if necessary. Shortly before this, owing to a report from the 2nd Cavalry Division that successive lines of German infantry were massing for attack against Oesttaverne, and in response to an urgent call by the Cavalry Corps, the 6th Cavalry Brigade (3rd Dragoon Guards, 1st Dragoons and 10th Hussars), one battery R.F.A. and one battery Howitzers, were sent at 11 a.m. to their support. The 7th Cavalry Brigade (1st and 2nd Life Guards and Royal Horse Guards) was moved at 10.30 a.m. to a point midway between Hooge and Zillebeke. At 12.30 p.m. the Germans developed their attack against Gheluvelt in great force, and the line of the 1st Division was broken. A General Staff Officer from the 1st Corps, who was sent forward to discover the exact position of the 3rd Cavalry Division, reached 1st Division Headquarters in time to find the situation critical, the line being broken and a part at least of the Division falling back rapidly along the main road. General Lomax ordered his reserves to hold the east edge of the woods just south-east of the bend of the road, while the 7th Cavalry Brigade was ordered to take up a line astride the road on the east side of the château grounds, behind which the 1st Division could rally. At this time all was quiet on the front of the 2nd Division, while on the south the 7th Division, assisted by troops which General Bulfin had collected under his orders, were being heavily shelled. The retirement of the 1st Division exposed the left of the 7th Division and, owing to this, the Royal Scots Fusiliers (21st Brigade), who stuck to their trenches, were cut off and surrounded. A strong infantry attack was delivered against the right of the 7th Division at 1.30 p.m., a short time after the G.O.C. 7th Division had moved two battalions of his reserve in rear of his right. "The line Frezenberg—Westhoek—bend of Main Road—Klein Zillebeke—bend of canal to be held at all costs." From Haig and Gough I learned that Lomax had been badly wounded, Monro, commanding the 2nd Division, temporarily disabled, and several Divisional Staff Officers killed at 1.15 p.m. that afternoon, when the Headquarters of the 1st and 2nd Divisions were shelled. On this General Bulfin was ordered to take command of the 1st Division, handing over the command of the 2nd and 3rd Brigades to General Lord Cavan, commanding the 4th (Guards) Brigade. Amongst the dead was poor Freddie Kerr, of the Highland Light Infantry, whom I had known very well at Aldershot. He was a rising man, and one of the most promising young Staff Officers in the Army. But the worst news was that the 1st Division had broken back and were in full retreat, only a mile or so to the east of where we were standing, with the Germans at their heels. What grieved me almost more than anything else was that the 1st Corps should at last be forced back after the glorious stand they had made. I felt that they had done far more than could be expected of any men, and that even if they were driven to the sea they had earned their country's lasting gratitude for the determined fight they had made. No shadow of blame could be laid upon them or their commander. I sought to express what I felt to Douglas Haig in order to try and soften the cruel blow I knew this catastrophe would be to him and to his command. To me, indeed, it seemed as though our line at last was broken. If this were the case, the immense numerical superiority of the enemy would render retreat a very difficult operation, particularly in view of the fact that Ypres and the River Yser lay in our immediate rear. Our only hope now seemed to be to make a stand on the line Ypres—Messines; but it was a great question whether this would be possible in face of a close and determined pursuit. Personally I felt as if the last barrier between the Germans and the Channel seaboard was broken down, and I viewed the situation with the utmost gravity. It was a dramatic half hour, the worst I ever spent in a life full of vicissitudes such as mine had been. It had a truly dramatic climax. At about 3 p.m. a Staff Officer galloped up to the front of the château with the news that the 1st Division had rallied and again moved forward. Gheluvelt was once more in our hands! The 1st Division had rallied on the line of the woods east of the bend of the Menin road; the German advance by the road had been checked by enfilade fire from the north. What had happened was that the attack against the right of the 7th Division had forced its 22nd Brigade to retire, thus exposing the left of the 2nd Brigade (1st Division). The G.O.C. 7th Division used his reserve, already posted in this flank, to restore the line, but, in the meantime, the 2nd Brigade, finding their flank laid bare, had been forced to withdraw. The right of the 7th Division thus advanced as the left of the 2nd Brigade went back, with the result that the right of the 7th Division was exposed, but managed to hang on in its old trenches till nightfall. At 2.40 p.m. the situation appeared so serious that orders were issued that although every effort should be made to hold on to the line originally given, if that should be impossible, the line Verbranden Molen—Zillebeke—Halte—Potijze was to be held to the last. But, as the events turned out, the pendulum was swinging towards us once more. On the Menin road a counter-attack delivered by the left of the 1st (Guards) Brigade and the right of the 2nd Division against the left flank of the German line was completely successful. By 3.30 p.m. Gheluvelt had been retaken with the bayonet by the 2nd Battalion Worcesters, admirably supported by the 42nd Brigade R.F.A. The left of the 7th Division, profiting by the recapture of Gheluvelt, advanced almost to its original line, and connection between the 1st and 7th Divisions was re-established. I could not then discover who was actually responsible for this dramatic success or to whom the chief credit was due. The rally had been centred on the 2nd Worcesters (5th Brigade, 2nd Division), who behaved with the utmost gallantry. It was not until some time after the battle that I ascertained that the original moving spirit had been Brigadier-General FitzClarence, V.C., Commanding the 1st Guards Brigade (1st Division). "On October 31st, 1914, the 2nd Battalion Worcester Regt. were in reserve to the 2nd Division who were on our left. About 8 a.m., finding the 1st Brigade rather pressed and having no reserve of our own, General FitzClarence got the loan of one company of the Worcesters, and this was placed along the railway line to Bercelaere, just north of Gheluvelt, to cover our right flank and to catch any Germans emerging from the village. This they did most successfully. Then a little later, when General FitzClarence found out how badly things were going on the right of the Scots Guards, he at once decided that an immediate counter-attack was to be made, and sent me off with orders to get hold of the remaining three companies of the Worcesters, and instruct the C.O. to counter-attack on the Scots Guards' right; the latter were holding the château. The three companies then went up through the company lining the railway, through the château garden, drove the Germans out of the village north of the main road, and re-established the line. It was undoubtedly entirely on General FitzClarence's initiative that this counter-attack was made, as he gave me the order personally." "I feel perfectly certain that by shoving us in at the time and place he did, the General saved the day. If he had waited any longer, I don't think I could have got the battalion up in time to save the South Wales Borderers, and fill up the gap." This most distinguished Irish Guardsman, FitzClarence, was killed a week or two later in the same part of the field, and his loss was most deeply felt. I determined that every possible effort must be made to prevent the recurrence of such a situation as I had just witnessed, and at once hurried off to find Foch. He was with d'Urbal, and we all went thoroughly into the situation. Foch told me that on the morning of the next day (November 1st) a French mixed force, up to the strength of a Division, would concentrate on the line St. Eloi—Wytschaete at daybreak, and advance from that line to attack the left flank of the forces in front of Haig. Similarly the 9th French Corps on Haig's left would be ordered to attack south-east against the enemy's right. I sent Barry (one of my A.D.C.s) and Brinsley FitzGerald (my Private Secretary), who were both with me throughout the day, back to Haig with a full account of my interview with Foch. They returned later with the information that the line of the 1st Corps had been completely re-established, and that just before dark Kavanagh's 7th Cavalry Brigade (1st and 2nd Life Guards and Royal Horse Guards) had done some good work in driving back the enemy. At the end of the day the brigade again became available to close a dangerous gap which had occurred on the right of the 7th Division. In the woods the Household Cavalry encountered large numbers of Germans, whom they cleared out, capturing many prisoners and inflicting heavy losses. Haig reported that they were of great assistance in restoring the line. Throughout this great day (October 31st) the flank of the 1st Corps had held fast to their ground. But the wooded country which intervened enabled superior forces of the enemy to penetrate to a dangerous extent between them. In fighting such as this it was inevitable that troops should become much intermingled and mixed up. It was not only so as between larger or smaller units of the same Army, but also by reason of the fervent loyalty and fine feeling which has happily always been so strongly marked a feature amongst the Allies. Throughout the day no effort was spared by any of the units engaged to afford each other the utmost mutual support without any regard to nationality, nor was there a moment's hesitation and time lost in waiting to get orders from superior authority. Not many hours of darkness had elapsed, however, before new anxieties arose in connection with the line held by the cavalry on the Wytschaete—Messines ridge. Events hardly less momentous than those of October 31st were before us.